After writing about wild harvesting yesterday, we’re now planning a trip to procure passionflower (Passiflora incarnata) for a dreaming tea blend soon to be in the shop. We saw it blooming over midsummer weekend in the near tropical heat and humidity. The passiflora are generally tropical plants, though nine species are native to the United States. Our local passionflower is a beautiful vine native to the eastern US; in fact, it’s the state wildflower of Tennessee and has been since 1919. The Cherokee in eastern Tennessee called it ocoee and the Ocoee River is named for it. The common name passionflower was given to it by Spanish Catholic missionaries to South America round about the 1600s, who saw in it’s flowers symbols of the passion of Christ. I personally think they look like alien lifeforms one would expect on Venus, but maybe that’s just me. Mountain folks in southern Appalachia call it maypop, or wild apricot, after the small fragrant fruits (they pop when you squeeze them) that ripen in late summer. 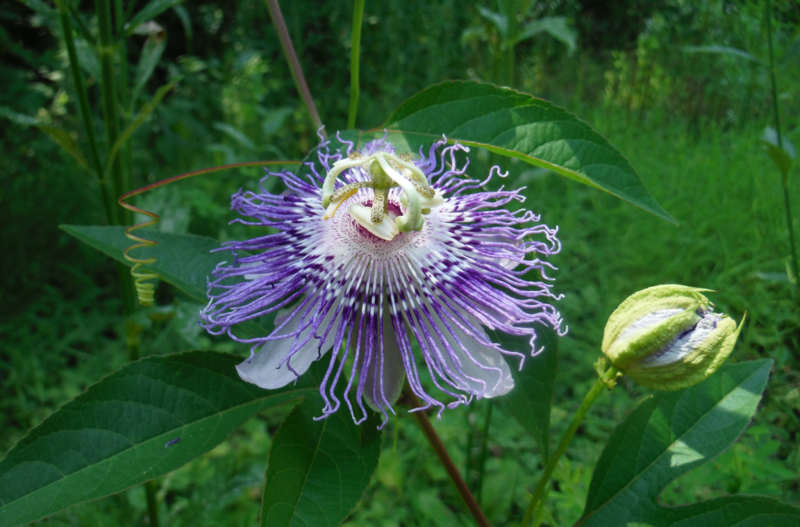 The fruits of maypop were used they used as a wild plant food and to make jams and jellies and flavored beverages, and the plant was one of the medicinal plants harvested from southern Appalachia and sold for its economic value. We’ve used scullcap (another nervine) for years, to aid in trance and soothing anxiety and insomnia, so we’re interested to be able to try passionflower. We planning on including it with other mild sedatives and trance aids, along with oneirogenic (a fancy word meaning “dream enhancing”) plants in a forthcoming dreaming tea– so look for it to be added to the shop soon!